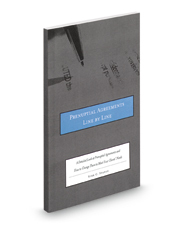 The sample agreement contained in this book outlines a variety of options and alternatives in drafting a prenuptial agreement, including some ways spousal support can be addressed, how property and debt division might be tackled, as well as potential confidentiality issues and potential agreements on alternative dispute resolution. While this agreement is not designed to include every possible provision, it acts as a useful starting point for the drafting of an enforceable contract. Prenuptial Agreements Line by Line is a valuable resource for anyone who has ever helped draft or negotiate a prenuptial agreement. A CD-ROM is included, which provides searchable PDF and Word versions of the book with a sample agreement.